Part 1 of this article explored the meaning of BIM and explained its place in today’s construction industry. 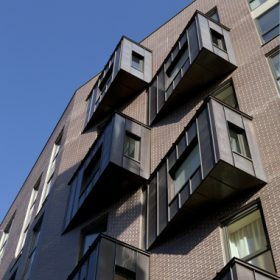 Part 2 demonstrates specific benefits of the BIM process and shows how Eurban use this at every stage of the design process: from conception to completion. BIM objects showing performance properties (thermal, fire and acoustic) can facilitate the architect in using analysis tools. Consequently, this can promote the viability of using timber in terms of the material’s improved properties, leading to the procurement of more sustainable buildings. 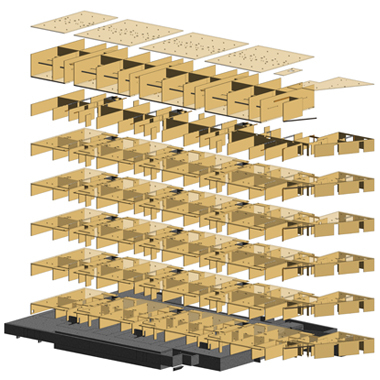 Drawing packages created in a BIM-enabled practice are more efficient and more accurate. For example, making changes to a 3D model engenders less misinterpretation and less opportunity for human error. This allows more time to be spent on modelling in 3D. In addition, it allows for various design options to be produced in the time that it previously would have taken to produce a single document set. All design options can be located in the same file until such a time as a one design is chosen. Designers rarely get it right first time – change is part of the process. As an engineering-consultant, this means re-modelling and re-engineering. However, with BIM we can link our model directly to the Project Engineer’s Primary FEM (Finite Element Model). This removes the time consuming task of creating and managing two models along with the additional benefit of ensuring that both models are always identical. Once the design has progressed further, information can be added to the BIM to improve other aspects of procurement. 4D data including time/programme information can lead to significant improvements on site. Such information assists the main contractor to co-ordinate schedules, to enhance safety by design, and to eliminate conflicts and confusion. The main contractor can input information regarding cost and resource requirements to add a further dimension: this is 5D BIM. This enables predicted spending versus actual spending to be tracked over the course of the project, improving cash flow and keeping to budget targets. There are benefits/improvements to on site health and safety with the ability to pre-plan trades and working areas against the programme and 4D BIM. The 3D model assists in the creation of complex 3D installation drawings. The use of hand-held tablets on site is becoming more widespread. They can be used for creating snagging reports as well as carrying out hand over checks with the design team. Whether surveying traditionally or electronically, a BIM model is a useful reference and will improve outcomes. A 6D BIM project would have all of the sub-contractors’ supplied products within the model and these would contain all operation and maintenance data both in the BIM model and in the COBie spreadsheet. This is the area where the largest cost savings are seen. 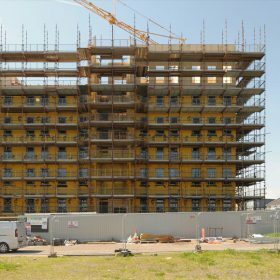 Huge cost savings have already been made where BIM is used in early project stages and onwards. With government backing and growing industry adoption it seems that the benefits of BIM will be seen increasingly in the months and years to come.